We've been wholly unsuccessful in assessing the stage of change people are in. We included this as part of an assessment to select participants for a weight loss program we ran. Each person was suppose to have been in either the preparation or action stage to be selected. Unfortunately, as the program progressed we learned that most were in the contemplation stage. That is, they were aware that a problem existed and were seriously thinking about overcoming it, but had not made a commitment to take action. I think one of the reasons the participants lost so little weight during the program was because most had not committed to action. 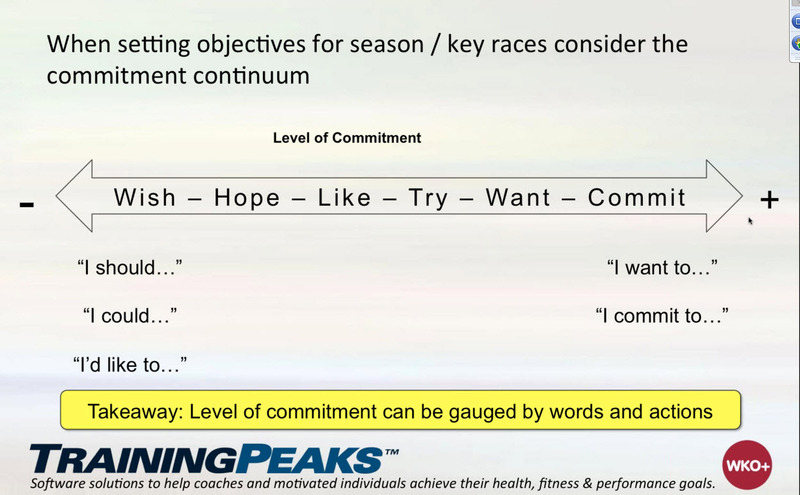 I recently participated in Dave Scott's Mental Training Tactics and Race Day Strategies of World Champions, a webinar sponsored by Training Peaks. They presented this chart on commitment. I'm wondering if it would be more relevant for us to try assess level of commitment than stage of change for some of our programs. What do you think?